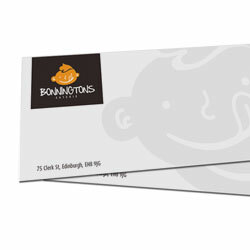 Our compliment slips are printed on a white 90gsm cartridge paper suitable for inkjet and laser printers at 210x99mm to fit a standard business size envelope (DL). We can offer many variations and other sizes, including 1 and 2 Pantone Colours, embossing, coloured and textured papers, and reverse printing – simply call us for an immediate quote. Prices exclude VAT at 20% and include delivery.